We sell fairly traded, organic coffee, tea, chocolate products, olive oil & spices. (#3 - 2440 Rosewall Cres., Courtenay). Dark & Light Roast – Our coffee growers in Nicaragua are co-op members and get a guaranteed price above the world market price, freeing them from the risks of its fluctuations. The “cooperativos” (Flor de Dalia and Flor de Pancasan) are located in the mountainous region of N.W. Nicaragua near Matagalpa. 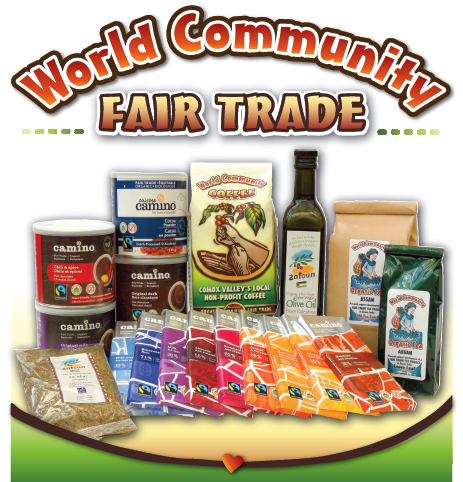 World Community Coffee is shade grown and certified organic; protecting people, animals and the environment. 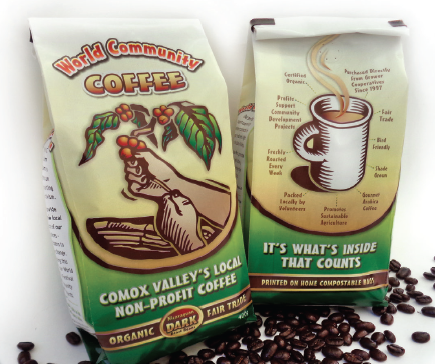 The gourmet Arabica beans are freshly roasted in small batches each week at Creekmore’s Coffee in Coombs, B.C. 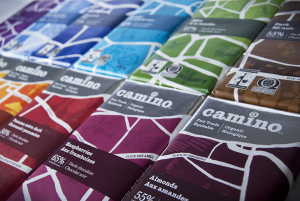 Profits from Coffee sales support primary health care programs (APS) in Nicaragua. Click here for more info. 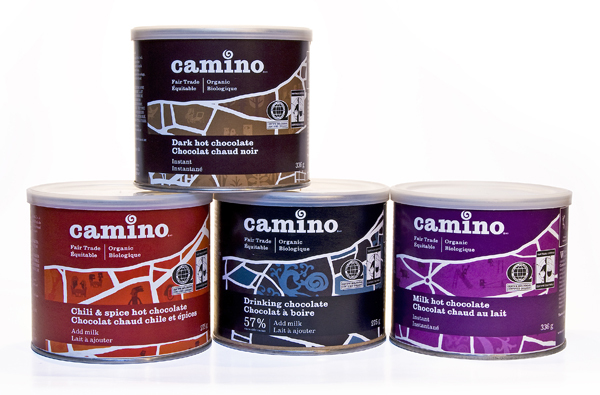 Our Decaf Coffee comes from Chiapas, Mexico. 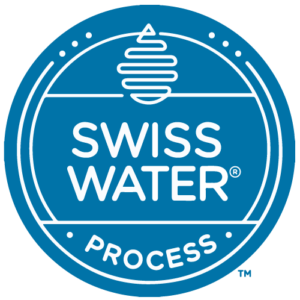 This coffee is decaffeinated using the Swiss Water Process, a non-solvent environmentally friendly method. 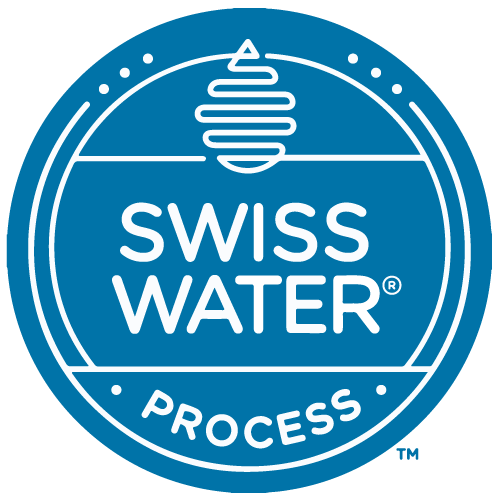 This process was introduced by Coffex in 1979, and was, at that time, the only commercial decaffeination method that did not use solvents. Our Espresso blend was created in 2012 and has become very popular. We also sell organic, fairly traded Olive Oil, Za’atar Spice, and other products. 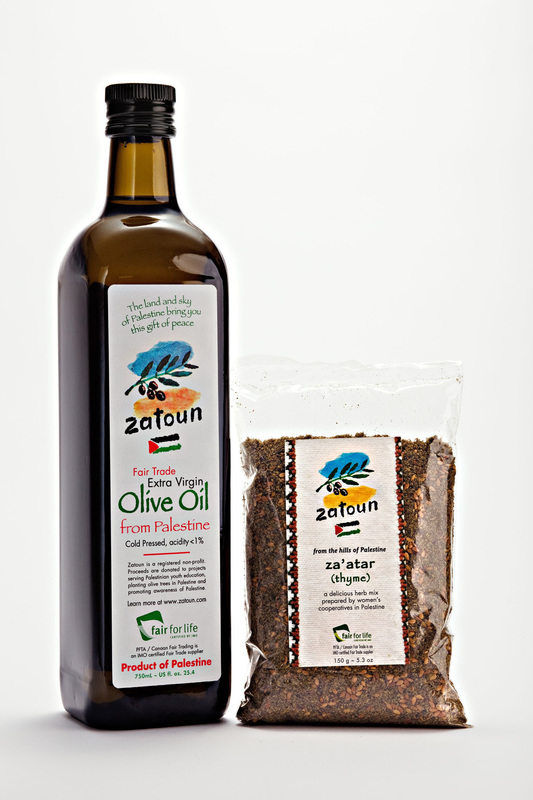 Olive Oil - Support the farmers of Palestine in the struggle for their livelihood and land. Farmers are paid fair trade prices. Also, one dollar of each bottle sold will go to help support Project Hope, an arts and education program for young people in Palestine. An additional amount goes to replant olive trees inside Palestine which have been destroyed by the occupation. Za’atar Spice – Za’atar to Middle Eastern cooking is like what Essence is to Emeril. Za’atar is a spice blend that is so versatile! It can be used on meats, veggies, rice, and breads. And, yes, it has been known to make me yell “Bam!” every once in a while. To purchase, please contact our sales manager. 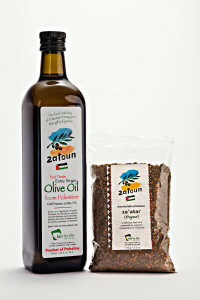 Zatoun olive oil and za’atar dip: Cut Italian, French or pita bread into squares. Dip in oil and then in the za’atar. Or mix them together and dip! Pita crisps: Brush pita with a paste made of equal amounts of olive oil and za’atar. Split pita into two rounds and brush oil mixture on insides of bread. Cut each round into 8. Bake, oiled sides up, at 350 until golden (about 8 minutes). Veggie dip: Mix 1 cup yogurt, 1⁄4 cup za’atar. Serve with veggies or crackers. Experiment with adding sour cream, cottage cheese, etc. Salad dressing (good on Greek-style salads): 1⁄2 cup olive oil, 1⁄4 cup balsamic vinegar,1 Tbsp. za’atar, 1 Tbsp. lemon juice, salt pepper. Marinade for meat or BBQ vegetables: Use the salad dressing recipe. Marinate 15-20 minutes. Baked vegies: Coat vegetables with Zatoun olive, bake as needed. Sprinkle za’atar over about 10 minutes before removing from oven. Za`atar eggs: Scramble eggs as desired. About 2 minutes before removing from heat, fold in za’atar. Za’atar garnish for hummus, dips, soups veggies. Delicious! Mashed potatoes with olive oil and za’atar. Use oil instead of butter. Sprinkle with za’atar. Mediterranean pizza with olives, feta & za’atar: Brush olive oil on dough fi rst. Makes a lovely light pizza. Add other veggies as desired. Mediterranean pasta salad with olives, feta & za’atar: Use any shaped pasta, pour olive oil over, add olives, cubed feta and sprinkle with za’atar. Add other veggies as desired. A Traditional Mediterranean Snack: Cut up wedges of watermelon, wedges of feta cheese. Serve with za’atar, pita and hot mint tea. Preheat oven to 350 degrees F. Grease an 8 or 9 inch round cake pan. Trace a parchment paper circle and line the bottom of the pan. Grease the parchment paper as well. In a large bowl, whisk together the almond milk, olive oil, vanilla, sugar and lemon juice/zest. Transfer batter to the greased cake pan and bake for 25 minutes, or until cake springs back when lightly touched. While cake is cooling, prepare the glaze. Whisk together the powdered sugar and almond milk in a small bowl. After cake has fully cooled (don’t do this while it’s still warm! ), pour the glaze over the top of the cake. Serve. Store in a covered container for up to 5 days. Rinse bulgur in cold water, squeeze, sprinkle with salt and let stand for 20 minutes. Place the sliced onions in the bottom of a 9″ square baking pan (spray the sides with oil). Cover the onions with 1/3 cup of the oil. Let cool until you can handle it and cut the diamond shapes all the way down to the bottom of the pan. NOTE: It is important to use VERY HOT chickpeas and liquid in this recipe- it is one of the secrets to making creamy hummus without having to remove the chickpea skins, as is the norm in the Middle East. Place the hot chickpeas and the liquid that just covers them in a blender (preferably high speed) with all of the ingredients. Process until it is very smooth and creamy- no granulated texture. Grind nuts finely(blender or food processor). Scrape edges to dislodge any cashew butter created. Add cocoa powder and hot chocolate mix. Blend briefly. Add dates and vanilla. Pulse several times until dates break down a bit. Then blend until quite smooth . Form balls. Using a spoon, push mix against sides of bowl and then squish together or roll by hand. Keeps well in fridge or freezer. Bring to room temperature to serve. Place all ingredients in a blender or food processor. Pulse to break down frozen fruit; then blend until consistency of ice cream. If berries are frozen, you may need to add 1 – 2 T of liquid (milk or substitute or water) to get started. Blend all until smooth. Divide into individual servings, cover and place in fridge for about 2 hours. You won’t taste the avocado but it gives a very smooth texture and is one of the healthy fats. Note: To test avocado for ripeness, remove the stem and check the colour of the flesh. It should be green, not yellow or turning brown. ½ cup over ripe banana mashed well. 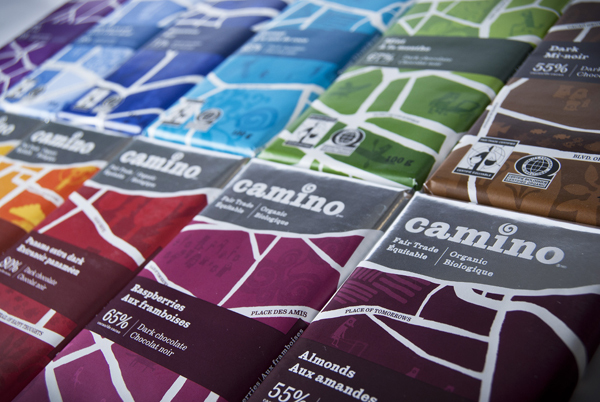 Combine all the dry ingredients and the chocolate chips and mix well. Mix all the wet ingredients together. If the banana is not very ripe, place it in a blender to get a smooth paste. It’s best to avoid lumps in this so that you don’t taste banana in the fudge later on. Now pour the wet into the dry ingredients and mix well. Pour the batter into a pan which is greased (with olive oil) and dusted (with whole wheat flour) and place it in a preheated oven. Bake at 170 degrees C for about 15-20 minutes or till the top looks cooked. Now I cooked it till the tooth pick inserted came out clean but if you want the brownies to be gooey you can leave it slightly undercooked. Note: Instead of the apple cider vinegar, regular white vinegar will work fine. Lots of people have used apple sauce instead of mashed banana with great success. Use any other oil of your choice instead of oil oil. I have used jaggery instead of sugar in this recipe and it turns out great. Add a table spoon of instant coffee powder for a more deep chocolate flavor. This batter works very well even as cupcakes.